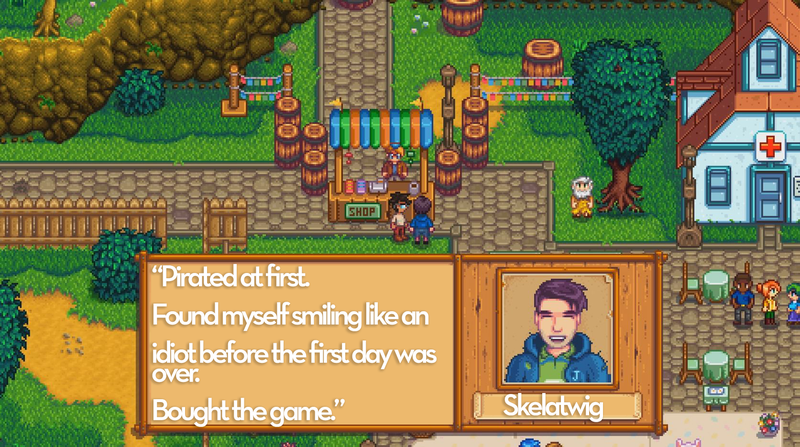 Humble farming simulator Stardew Valley is taking Steam by storm right now, and when you consider the charm, depth, and number of cuties you can smooch within the game, it’s no surprise why. Better yet, the town itself seems to be full of mystery, too. This far in, I still haven’t unlocked all the areas on the map yet, nor have I come anywhere close to seeing all there is to see. I’m obsessed. The rest of Steam is too. Right now, Stardew Valley is sitting on an “overwhelmingly positive” user review score. Users aren’t just citing the gameplay here, though. They’re also pretty impressed that a game as massive as Stardew Valley could have been made by a single person, developer ConcernedApe. You can check out more Steam reviews for Stardew Valley here, or read our ongoing “As Told By Steam Reviews” feature here.